I plan to make related blog posts of things mentioned in the book soon. Please come back for more! 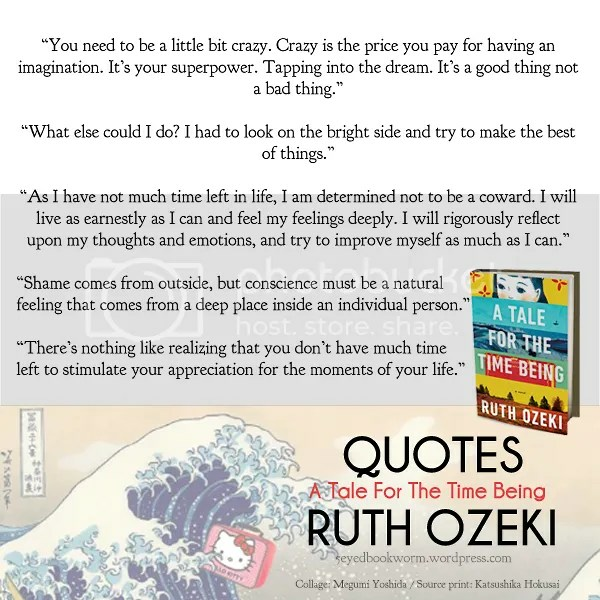 Categories: Notable Quotes | Tags: a tale for the time being, book quotes, quotes, Quotes from books, Ruth Ozeki | Permalink. 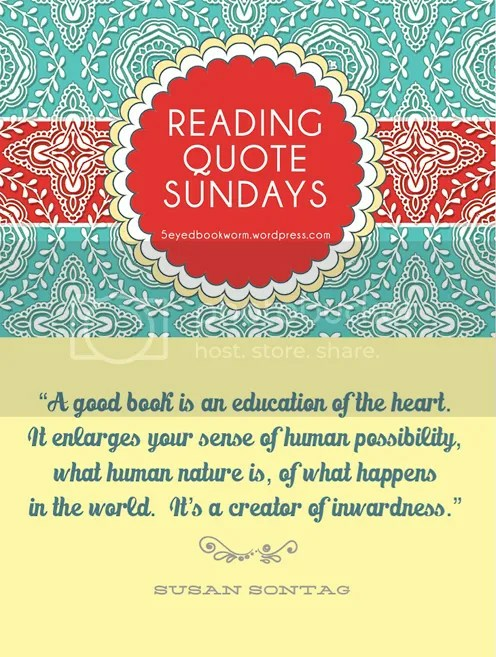 Every Sunday, I’ll be posting one quote about books or reading that I really like and share how this relates to me. If you would like to join me, please post a quote in your blog and share with us why you chose it or how it personally affects you. You can leave a link in the comment section below and I’ll update this blog post with your link. I found this quote about reading lovely. How true is it that books help us in the discovery of our selves. Do you have a favorite reading quote? 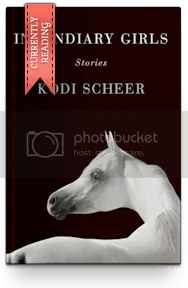 Categories: Reading Quote Sundays | Tags: reading quotes | Permalink. Here’s a confession: the only book series I ever completed was The Hunger Games. I almost completed The Diary of Wimpy Kid books too but somewhere in the way I became a wimp and never touched another book from the series. I also have a bad habit of watching movies inspired by a book series then forgetting reading the book all together. Case in point: The Millennium Trilogy by Stieg Larsson. When I finished reading the first book (which I really, really, really loved) I found out that it was made into a movie starring Noomi Rapace and I got hooked. I finished the trilogy watching the last two titles, forgetting the books. ALong with all the reading challenges I joined for next year, I also set a personal challenge to tackle a few book series. I’m not expecting to read all the books though. A book or two will suffice, I guess. First up is the Maddaddam Trilogy by Margaret Atwood. 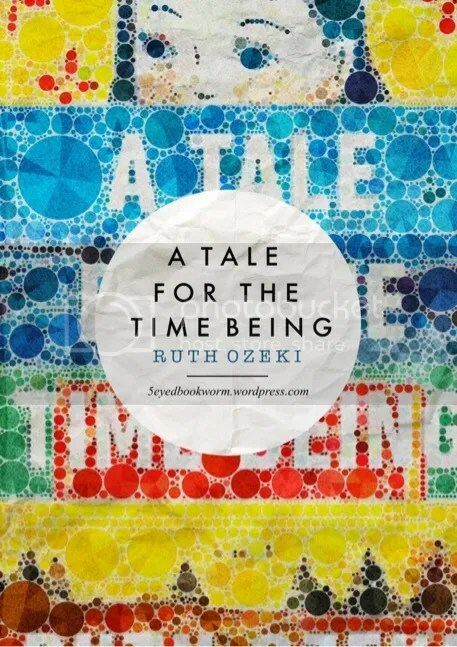 I’ve never read a book written by her so when Maddaddam was released this year, I was tempted to read it. Then I found out it was part of a trilogy. I know some readers go ahead and read the most recent ones but personally, I want to start in the beginning. I haven’t tried reading a book about zombies but since I’m on a mission to try new genres/ topics, I’m going to start with Mira Grant’s Newsflesh Trilogy. I am not particularly fond of zombies. First, they scare me. They scared me when I played Resident Evil and Silent Hill when I was younger, and they still scare me now. Second, I usually don’t know what to expect from these books. Does it involve consumption of humans? Creepy vocals? Perhaps. Perhaps not. Guess I’ll just have to read this to find out. Next up is Mira Grant’s Parasitology series, starting with the first book: Parasite. I’m on a science fiction roll here. Now, tapeworms do not fancy me in any way. (Zombies just now, and now tapeworms?) But this tapeworm seems harmless until we later find out in the synopsis that they have now become, surprise, surprise, “restless” (whatever that means). Restless is never good, right… Right? One of my favorite books of all time is The Silence of the Lambs by Thomas Harris. I usually do not like movie adaptations but I found the movie to be excellent too. I plan to read “Red Dragon“, the first book in the Hannibal Lecter series. To top it all off, I really want to read Koji Suzuki’s first book of The Ring Trilogy in 2014. This book inspired the creepy movie that raised hairs and voices during those late night horror movie marathons. They say it isn’t really creepy compared to the movie. Now I’ll be the judge of that. Then again, I become selectively wimpy at times so I hope I have the guts to finish reading it. Or maybe read in broad daylight. That always helps, right… Right? 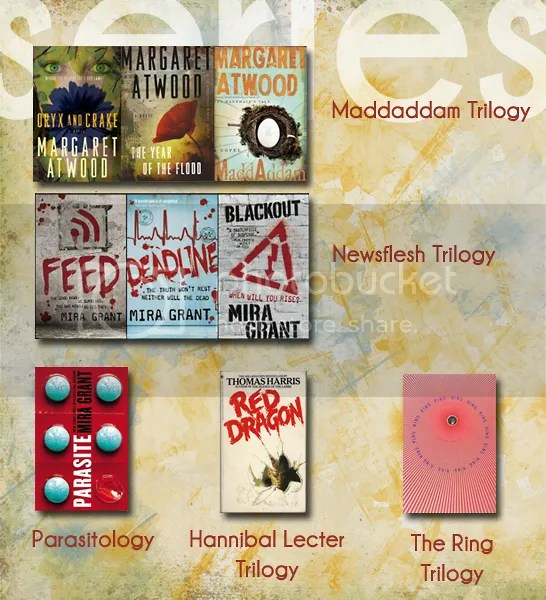 Categories: Reading Challenge | Tags: Book series, Hannibal Lecter, Hunger Games, Koji Suzuki, reading challenge, Ring Trilogy, Silence of the Lambs, Stieg Larsson | Permalink. 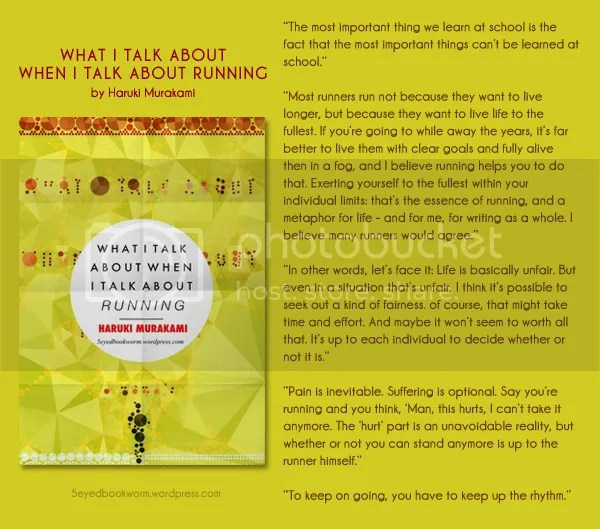 My favorite quotes from ‘What I Talk About When I Talk About Running’ (Read the REVIEW here). Categories: Notable Quotes | Tags: Haruki Murakami, What I Talk About When I Talk About Running | Permalink.